Although I have no direct experience of the illness, I am aware that Lyme disease is one of the most unpleasant illnesses to have. The multiplicity of symptoms that are generated by such a tiny organism are bewildering to patients, their carers and, to a very large extent, the medical profession. We don’t know how many people have been infected, or how many of those infected are suffering Lyme symptoms simply because the current NHS testing system does not provide all the answers. The story is not complete when a patient is finally given a diagnosis of Lyme, for there is no universally agreed treatment for its chronic symptoms and unfortunately, in far too many cases, it is too late for a cure. Lyme Disease UK is doing a great deal to break down the scepticism that surrounds the illness and their efforts to promote wider knowledge, accurate diagnosis through clinical history taking and effective diagnostic tests, and their invaluable advice and assistance given by sufferers to suffers has my heartfelt support. I had suffered from Lyme disease for 27 years, and just found out that my young son had the same illness, when I discovered the LDUK support group online. LDUK provided an important lifeline for me, like many people with Lyme disease, who often feel isolated, alone and largely ignored by the mainstream medical profession. I learned a great deal from other members as well as being given emotional support through some very tough times indeed. As well as providing a vital space for online discussion and friendship, LDUK is fully engaged with the campaigning and lobbying for changes in policy regarding testing, diagnosis and treatment. Entirely run by unpaid volunteers, all of them patients themselves, the group plays an indispensable role in helping Lyme patients throughout the UK and abroad as well. 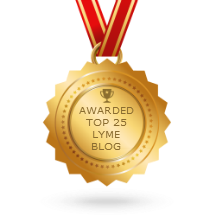 Lyme Disease UK has received a number of accolades such as Feedspot’s Top 25 Lyme Blogs, and several nominations for the Wego Health Activist Awards in 2013, 2014 and 2016.